I am sure you haven’t missed the wing beats of migrating geese whistling overhead these past few weeks, as these formed-up birds migrate above us. It’s a clear sign that the winter season is upon us as not just the geese but a myriad of birds make the journey from their summer breeding grounds to their winter haunts. On arrival, tired from travelling, they will rest and feed throughout the winter. The ability of these birds to rest and feed is very important at this time of year. The most pertinent example of this is along our coastlines where wintering waders make the best use of low tides and rich feeding grounds. The rocky, sandy and mudflat shorelines provide a range of invertebrates for birds to forage. These areas are also an ideal place for people and their dogs to enjoy the outdoors. 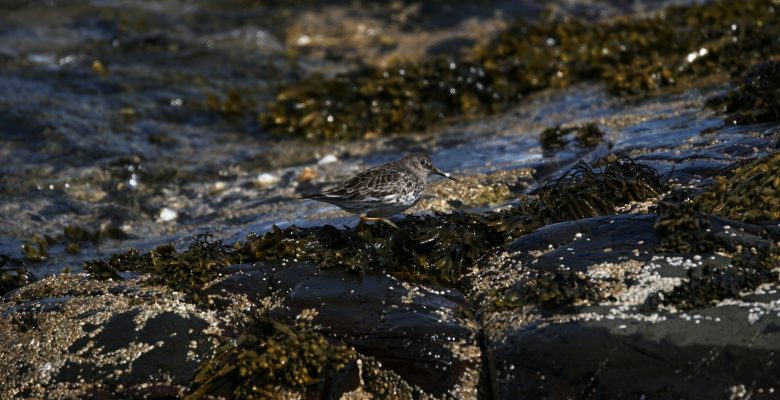 However, this activity can be at odds with the birds’ needs; every time a Turnstone, Purple Sandpiper or Golden Plover becomes alerted to their presence or they need to fly or move is time lost for foraging and resting. Over time and with continual disturbance, this increases the individual bird’s risk of fatigue, leading to serious health issues. When a relatively small length of coastline supports just over 2% of an entire population (Northumbria Coast SPA – Wintering Turnstone population), the need for management and protection becomes all too apparent. At EcoNorth, our handy gaggle of expert Ornithologists can often be found perched on an overlook surveying wintering birds; identifying populations and their essential feeding and resting areas. This data is used to determine impacts from our clients’ developments (such as noise or visual disturbance) so we can devise evidence-based mitigation strategies for bird protection. This prevents population decline and helps clients meet their needs.